How to Handle IELTS Examiners Who are Intimidating? Coming to a job interview can bring cold feet to anyone. Everyone feels scared and very anxious when sitting in front of their future employers and is being evaluated with every question they ask. Some are very good in handling themselves in these stressful situations while others are not, and as a result, they fail to get the job. This exact scenario also happens to people who are scheduled for the IELTS speaking examination. The IELTS speaking test is a face-to-face interview with a native English speaker or a trained non-native English speaker. The test will last for only about fifteen minutes but, according to some candidates, the fifteen minute interview seems to be an hour because of the anxiety they feel during the interview. To make matters worse, some examinees have very intimidating IELTS examiners. With this type of examiner, candidates are distracted on how they can impress their examiner. How exactly can one handle intimidating IELTS examiners? · Before going in the interview, think of the reason why you are taking the IELTS. You need an inspiration to help you do well in the speaking test. Tell yourself that you need to do well because your future relies on this examination. Have a positive mind set before stepping inside the room. · During the interview, look at the examiner straight in his or her eye. This will show them that you are confident with your answers. This is a display that you do not fear whatever intimidation they are planning to show on you. Act tough and always smile in giving your answers. · Maintain the tone of your voice. When your voice sounds on high or very low, the examiner knows that you are nervous; thus, you will start feeling anxious. Always speak in your normal tone. Clear your throat before speaking if you think this helps. · Speak clearly when you are being interviewed. Do not give the examiner the chance to comment on how confusing your response is with his or her facial expressions. · Give them full detailed answers. Make them feel that you are interested with what they are asking. · Do not look on the notes the examiner is writing. Once you look at them, you will get distracted. · Always come to a speaking test prepared. When you know that you have the right amount of preparation, no one can intimidate you. Feeling anxious or getting intimated is a normal feeling in an interview. You have to handle yourself by believing that you are prepared and your responses can impress the interviewer. Speaking in English is common to many Filipinos. It has been a part of our daily conversation. This has been influenced since English has been used in schools and offices. Moreover, Filipinos are fond of watching English movies and following American TV series. Thus, it is not surprising why most Filipinos can speak the English language. Because of this, a lot of foreign nationals expect Filipinos to be great in communicating in English. In applying for work, study or immigrant visa in English speaking countries, an English proficiency examination is a requirement. Filipinos have to take the IELTS or the International English Language Testing System examination. The test has four sections and the speaking test is where most Filipinos feel anxious. Taking the IELTS speaking test feels more pressure because of the standard score set by the companies and academic institutions overseas. It is important to any candidate to hit the target score to be able to lodge their applications. How can one get a high score in the IELTS speaking test? There are three different tasks in the test. As a candidate, it is much better to know what each task asks you to do and the way on how to make appropriate responses. The first task of the speaking test is an introduction. The examiner will be asking some familiar questions on familiar topics like work, study, hobbies, family and personal background. There are a lot of these questions online that are for free. People have the tendency to speak very fast when they are nervous. Speaking fast causes words to come out not very clearly. When this happens, the examiner will not be able to understand your response. When they fail to understand the response, you will eventually lose some points. Choose words that will best express your ideas. Using new vocabulary will not only showcase the strength of your vocabulary bank but also avoids redundancy on the words you are using. A good response has correct grammar and well-constructed sentences. Be consistent with the verb tenses. Find someone who can help you practice speaking. Someone who can evaluate your responses and give comments that can develop not only your speaking skills but also your confidence in using the English language. IELTS review centers have speaking coaches that are professional in addressing problems in speaking. Getting a high score in the IELTS speaking is possible with the right practice and guidance from IELTS speaking coaches. Studying is a tedious yet important part of being a student. A lot of students complain of studying for long hours just to review for a final examination. College students would spend about two weeks to prepare for a midterm examination, and even would go for a month to be ready for the finals. Since getting a high score in exams is the aim of these students, they do not mind studying in the library for hours and staying up late at night to review their notes. Is this style of studying applicable in reviewing for the International English Language Testing System examination or the IELTS? Test takers for the IELTS test prepare for months before taking the examination. It is not a simple English comprehension test with a multiple choice or true or false type of question. Different types of questions are involved in the different tasks in the examination. Moreover, since there are four sections in the examination: reading, listening, speaking and writing, skills are needed to successfully respond to the different questions. When taking the IELTS, it is recommended for candidates to be in IELTS review centers. Most IELTS review centers have two different kinds of programs: the unlimited review and the intensive review. In the unlimited review program, students can review in the center for a year. They are given the opportunity to study with their teachers until they are ready for the IELTS examination. Though this is an unlimited review program, most candidates take about two to three months before taking the real test. Within this time, candidates are introduced about the IELTS, the sections and the tasks in each section. Skills will be developed within the given time and mock tests are administered to evaluate their progress. The intensive program is a two-week program that focuses more on mock tests and coaching for the real test. The candidates will be given intensive activities to hone their skills for the IELTS. Most candidates who enroll for this program are those who have already taken the test and want to take a refresher course for the IELTS. Candidates should bear in mind that reviewing for the IELTS should be taken seriously. The coaches are there to guide and help build the necessary skills; hence, it is important for these candidates to attend classes every day and participate in every classroom discussion. It may take a few months to be prepared for the test, but it is much better than to take the test with a little knowledge on how to make responses to the tasks. Learning about the IELTS is not possible in one night. Time and effort should be put into it as well. The IELTS or the International English Language Testing System examination is taken every month in the Philippines. The number of test takers has been increasing over time making this test a demand to any Filipino who wish to work, study, or migrate in English speaking countries overseas. The weight of one’s IELTS score is very important as lodging of the application depends on how well the applicant hit the set score requirements. Hence, preparing well for the exam should be done seriously. Among the four sections of the examination, reading poses a great challenge on the individual’s comprehension skills. The readings are composed of texts, which could be lengthy, that range from simple to complex in terms of difficulty. Some people who are fond of reading do not have a hard time with the test. To those who do not, it could be pretty hard. For any test takers of the test, it is best to know the types of mistake that are commonly done that should be avoided in the IELTS reading test. 1. Do not write more than the number or words or answers required. Say for example that there are two choices that you think are both correct in a specific answer. You wrote them down thinking that it will still get a point. The truth is it will be considered incorrect. Choose one to write on your answer sheet. Further, if you are asked to write for at least three words, do so. Though you have the right answer but it exceeded the number of words, it will be incorrect. Stick to the instruction to avoid getting this kind of mistake. 2. Do not panic if you do not know about the topic. Some people give up on reading a certain reading passage because they are clueless about the topic. The test will note evaluate your prior knowledge but on how well you can understand the passage given. The answers are all in the passage. All you have to do is read and get the gist of it. Make sure your handwriting is legible. If examiners cannot understand what you have written, they will automatically put an x mark on it. Transfer your answers and make sure you write them clearly. 4. Check for any mistakes. Double check on the grammar, spelling and any errors. Most candidates overlook this that they end up getting mistakes. Reading is much easier when you know what to do while answering the questions. Always read instructions and take note on key words to be found while reading. Doing this makes looking for answers easier and much faster. In preparation for an upcoming test, examiners review their notes to remember the lessons. A lot of students even allot long hours studying in libraries or meeting with study groups. Getting a good score is really important most especially for students who are achievers in class. The same preparation for review is done by test takers of an English proficiency exam like the IELTS or the International English Language Testing System exam. Test takers are very eager to review for the IELTS exam. All of these candidates are getting ready to apply for a job, a slot in a university or for an immigrant visa in English speaking countries. To be able to get a good score for the exam, one must strive hard in reviewing and developing their English skills. One way of getting familiar and even ready for the examination is getting information of the topics used for the examination. This will help candidates know which topics to focus on and to anticipate for the test. How is the area you live? Do you know many people around? Is it good place to live for families? Does weather change the mood? Do you prefer to live in extremely hot or cold weather? Do you ever discuss weather with your friend? Describe what you do to keep you healthy. When do you do it? How it improves your health? Why do you think this is good law? Do you think doctors should educate people for health? What kind of activities can keep good health? Do you think the media influence our health? How should schools keep children healthy? Do people like this law? How popular is police job in your country? What are the qualities of a police officer? Do you think police job is better than any other professions? Recently you attended a conference. Write a letter to your manager for preparing a presentation for the colleagues. Why it is required for colleagues? Are they interested in the presentation? Young people are getting more influenced by friends than parents or teachers. For IELTS candidates, enrolling in an IELTS review center can give them a lot of advantages compared to those who do self-review. With IELTS review centers, one can get training and get feedbacks from coaches on how to improve and build their English skills. For more IELTS IDP Test dates, visit https://www.idp.com/philippines/ielts/bookatest. If you need the best IELTS training, you may want to avail the following promos. Visit http://www.jroozreview.com/promos-and-discount/ for more information. What is the Difference of Graph and Diagram for the IELTS Writing Interpretation? Known to be a very difficult writing task, the International English Language Testing System exam’s writing section is dreaded by most of its candidates. As all IELTS test takers know, the test is divided into two modules: the Academic and the General Training. The most difficult writing tasks are in the Academic Module. The first task in the Academic module is an interpretation of either a graph or a diagram. People who would experience this task will surely be surprised. Writing an essay is already difficult, what’s more if it is a data interpretation? Graphs and Diagrams are very different. Let us have an example and outline the things a candidate needs to write in his or her own essay. How can one write an essay? Here are some guide questions for your essay. Which has the highest reading? The lowest? Is there any significant increase or decrease in the years? Can you see the average percentage in this chart? What process is shown in the diagram? What is the vocabulary needed to describe those objects? What happened first? Second? Next? What materials or equipment is involved in the process? Looking at it, the two diagrams differ on how you will interpret them. The graph will be more focused on highlighting the increase and decrease of numbers in the data. Transition words to show increase and decrease will be utilized in the essay. On the other hand, the diagram will be concentrated on showing how a product becomes or is developed through its process. Transition words to show flow or step-by-step procedures are needed. Though they are different, candidates have to consider the flow of ideas in the sentences. It is best that candidates create an outline first before starting to write the essay. In this way, the candidate will be able to make sure that the ideas are organized according to the importance in mentioning in the essay. To improve writing skills, one must practice a lot. Further, one should ask help from writing mentors such as those in IELTS review centers. Not only writing skills are important but also the correct usage of grammar. Review on grammar and sentence construction to have the best writing possible in the IELTs writing test. The listening test in the International English Language Testing System examination is considered by some to be very easy. While some agree with this, there is still a majority of people reviewing for the test who will oppose with this statement. The listening test is a comprehension test on how well candidates can understand the listening passage and the details in the passage. 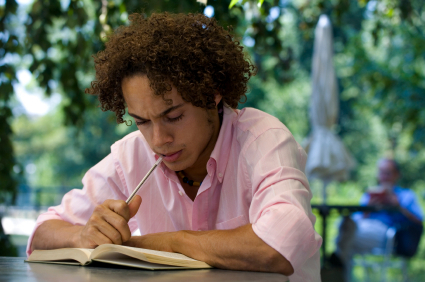 IELTS test takers need to be good at note taking to be able to answer the questions correctly. In fact, candidates for the IELTS listening test have the advantage in their test for they can see the question while they are listening to the passage. They are also given a few seconds to scan the questions before the listening task is played. What the candidates should do is improve their listening skills. How? 1. Generally improve your listening skills by practicing on different listening materials. Do not settle with just practice tests in the IELTS. You can listen to some news reports online, podcasts, or even listening to music can be a big help in enhancing your listening skills. Go online and check websites that have listening exercises. 2. Since it is a listening test, you must be very sensitive in getting details particularly spelling. Some names are spelled out so you have to listen to them very well. Make sure you follow the rules in capitalization while answering the test. 3. Instructions are recorded and not written on your test questionnaire. Listen and find clues in the instruction. You have to learn to anticipate what you will be listening. 4. With the little time given to scan the questions, be familiar with the details that you need to find in the passage like names of people, streets, amount of something, time and the likes. 5. Vocabulary is important. Candidates can be in trouble if they fail to understand what the lecture is all about because of some words that are unfamiliar. Be sure to be familiar with words that are commonly used in the IELTS test. 6. Do not leave questions unanswered. Instead of leaving them blank, take a guess. Choose your best guess and this could be right. 7. Some choices look the same but are entirely different. Know how to eliminate answers until you come up with the best and correct answer. 8. Given some seconds to check your answers, check for misspelled words and word forms of your answers. 9. Avoid careless mistakes by writing your answers on the wrong section of the answer sheet. Do not panic in answering. Keep calm and read carefully. 10. Listen carefully. Focus on the passage while it is being played. Let your mind concentrate on the passage and avoid getting distracted with unnecessary noises. Listening becomes easier once you practice the tips mentioned. Of course, getting a good IELTS listening score is also possible when you always do practice tests and learn from your mistakes. - How does IELTS work? - Why do I need IELTS? - Why choose JROOZ in taking my IELTS review? For more information, please visit Jrooz IELTS Open House October 25, 2014. What are the Five Useful Grammar Tips on IELTS Writing? Almost everyone in an English class thinks grammar class is difficult. Well, the reason behind this impression is the different rules in grammar that every English speaker must know. In taking English proficiency examinations like the IELTS or the International English Language Testing System, grammar is most needed in the writing section. There are a lot of people who commit grammar mistakes. Some may have overlooked the rule while some are just careless in committing these mistakes. Grammar is an important criterion in the test. Poorly constructed essays due to grammar errors will not give you a good score. So as not to waste your effort in writing, here are the five useful grammar tips on IELTS writing. This kind of sentence happens when two independent clauses are joined in one sentence without the correct conjunction or punctuation. My niece is a smart baby, she learned to speak at the age of one year and six months. (a) Instead of making it in one sentence, make them into two separate sentences. My niece is a smart baby. She learned to speak at the age of one year and six months. (b) Use a semi-colon instead of the comma. My niece is a smart baby; she learned to speak at the age of one year and six months. (c) Use a coordinating conjunction between the two sentences. My niece is a smart baby, and she learned to speak at the age of one year and six months. If the subject is singular (only one), use a singular verb. If it is plural (more than one), use the plural form of the verb. The president, who is talking with his cabinet members, is discussing the current problem. We use “is” as the subject of the sentence is the president, not the cabinet members. The police are expected to respond in crime scenes as soon as possible. The verb “are” is used as the noun “police” only takes a plural verb. Pronouns substitute nouns; however, make sure that the pronoun you are using is a correct replacement of the noun. Singular nouns should take a singular pronoun and plural nouns with plural pronouns as well. The class must turn in ITS/THEIR project by Thursday next week. Its and Their can be used in this sentence with difference in meaning. When we use “its” we are referring to the class as a single unit while “their” refers to the individuals in the group. Modifiers describe the word within a sentence; hence, it should be next to the word it modifies. Misplaced modifiers when the modifier is placed away from the word it modifies making the context of the sentence confusing. Incorrect: While I was in Europe, I was shocked to see a gate behind a house made of paper. Is the house made of paper or the gate? Correct: While I was in Europe, I was shocked to see a gate made of paper behind a house. Incorrect: Walking to the theatre, the rain poured heavily. The rain was the one walking? Correct: Walking to the theatre, Jim help an umbrella as the rain poured heavily. Apostrophes are mainly used to show possession and contraction of some words. Other than that, it is already a grammatical error in the usage of punctuation. These five common grammar errors can be avoided through constant practice in grammar. Familiarity with the rules is easy as long as you keep reviewing and keeping in mind the basic rules in grammar. Who wants to get a perfect score in an examination? Well, everybody wishes to perfect an examination. People feel good about themselves when they get perfect scores – makes them feel smart among others. However, there are times that we commit mistakes in the examination. Mistakes are normal but can be avoided. That is why it is important for every student to review for the exam and be able to answer all the questions correctly. What if you are taking the International English Language Testing System examination, are mistakes unavoidable? As like what other candidates for the IELTS test say, “There’s no room for mistakes in taking the IELTS.” Well, this is a good motivation for candidates. It will push them to study harder and learn more skills for the exam. However, what will make them avoid them is to know the common mistakes in the listening section. Here are common mistakes one gets in the listening plus solutions on how to avoid them. Incorrect spelling. There are no considerations done with incorrect spelling. To avoid this problem, listen closely to the audio. Pay attention if it’s a singular or plural noun. Leaving a question unanswered. Unsure of your answer? Do not just leave it blank. Take a guess of the closest option you have in mind. It is better to answer it with your best guess. Who knows, this could be right. Number of words on the blank. Do not write over three words. Follow the instructions carefully to avoid this mistake. Impulsive answers. Some candidates immediately write their answers as soon as they hear a clue within the listening passage. As much as possible, let the passage finished first before finalizing your answers. Ignoring keywords. Before the listening passage is heard, candidates are given some time to browse on the questions. Look for key words that will serve as hints for the answer. Failure to answer map directions. Reading maps can be very difficult. To avoid mistakes, listen to it carefully. Take note on the turns mentioned, right or left, and even street names to get the questions right. Not understanding the question. Candidates have to comprehend what the task is all about. Read it carefully and understand what it needs from you. Choosing an option because the keyword is there. Do not be complacent with this type of options. It is usually a trick option; hence, it is important to listen on the exact details in the listening. Overlooking the 30 seconds to revise answers. Some do not revise their work for misspelled words making their answers wrong. Given this time, review your answers. Change if necessary. Losing focus on the audio passage. While you listen, you multitask. However, do not lose focus on the passage. To avoid losing focus, use the time given to browse the questions and concentrate on the listening passage when it is time to listen. Mistakes can be avoided if you know what these mistakes are. Practice more on listening and learn how to answer the listening section correctly. Are you taking the International English Language Testing System (IELTS) exam here in the Philippines? Filipinos, known to be good English speakers, are one of the nationalities who have the highest number of people taking the IELTS test. This number shows us that more and more Filipinos are interested in working and studying overseas. Some of these people are even taking the IELTS for their immigrant visas to grow old or retire in English speaking countries. There is no doubt that Filipinos are good at speaking English. However, being known to be good is not enough. Filipinos need to provide proof of their fluency through the IELTS examination. It gauges their expertise in using and understanding the language that will make them productive once working, studying or living overseas. 1. The IELTS is hosted by its two agencies here in the Philippines: British Council and IDP. These are two different organizations but the content of the exam is the same for both. 2. The IELTS test is available in the three major cities in the Philippines; Manila, Cebu and Davao; and other cities like Dipolog, Batangas, Iloilo, Naga, Leyte, Baguio, Cagayan de Oro, Zamboanga, Cabanatuan, and Tagum. 3. The main office of IDP is located at 2/F, Pioneer House, Makati 108 Paseo de Roxas, Legaspi Village and British Council is at 10th floor Taipan Place, F. Ortigas Jr Road, Pasig City. 4. Registering for the test on both organizations can be done online or by directly going to their offices. Registration can also be done with review centers that are accredited IELTS registration agents. 5. The cost for registering in British Council is PhP 8986 while PhP 8900 for the IDP. Be sure to have all the necessary requirements upon registration such as a valid passport, any government issues IDs and photos. 6. Registering in IELTS review centers are also possible as long as you are enrolled in any of their course programs for the IELTS test. 7. Most of the time, the IELTS test is scheduled once or twice in the cities mentioned above. 8. Reviewing for the IELTS is crucial. The British Council and IDP have free practice tests for their candidates to practice on before the test. 9. The IELTS certification is good for two years. It the certificate expires, the candidate has to take the examination again if he or she needs it for another requirement. 10. IELTS can be pretty challenging; hence, IELTS test takers are encouraged to take review courses for the test. This will help them prepare and be ready for the examination. Taking IELTS in the Philippines is easy. Get more information about the IELTS by engaging in course programs in IELTS review centers. You can also visit this page for frequently asked questions (FAQs) about the IELTS test. The fact that not all people are into reading brings problems to those people who need take a reading comprehension exam. Reading is something not most people would consider enjoyable or worthy of their time. For some, reading is pleasurable as it takes them to worlds unknown to mankind – that is reading fiction books. Others consider reading as their connection with reality as they are kept informed with the latest news and current trends around the world. In the IELTS or the International English Language Testing System examination, reading is a crucial part in the candidate’s examination. In the Academic module, there are long and complicated texts from books and journals. Anyone who has taken the Academic reading module says that it is really difficult and challenging. Having this said, how can one appreciate reading, especially for non-readers? - Letting this people know the benefits of reading. Reading is a good source of information and most of all new words. Through reading, people improve their vocabulary essential for the reading test. - Choose books that interest you. Find reading materials that will entertain you. You need to have your focus fixed on the reading and not wander. - Find reading materials that have light topics. Do not go into heavy reading materials such as long novels and epic poems. - Every day, read a single chapter of a book. It will help you gain motivation on reading. Eventually, you will improve by reading two to three chapters in the process. - Read news online. There are a lot of websites that have updated news that are not lengthy and wordy. - Find interesting blogs and websites on the internet. - Read comic books if you are into visual reading. - Browse the newspaper. If you are not interested reading the editorial or the headlines, go read on lifestyle or sports. - Find a topic that you think is interesting. If you are a medical professional, use your web browser and key in topics you are interested and read blogs or news articles about it. - Motivate yourself in reading. Always think of the positive effects and advantages most especially that points reading can help you in your IELTS test. Reading does not always have to be on books. Generally, you have to know what your interests are and find materials relating to it. It can be any reading material that you enjoy. It is an activity that is entertaining and educational. Are you clueless on how to register for the IELTS or the International English Language Testing System examination? Every candidate of the IELTS is familiar with the IDP. It is one of the two agents, together with the British Council, that are authorized to deliver the IELTS test here in the Philippines. Many candidates are quite worried on how they can register for the test. Do they need it to do online? Do they have to go to IDP’s office in person? Are there any documents needed for this registration? To help candidates have a full understanding on IDP’s registration procedure, here is a guide for candidates who wish to register online in IDP. 1. Go to their website at www.ieltsessentials.com. In this website, you will be asked on your preferred test location – your country and the city. Then, as you see a “BOOK ONLINE NOW” button on the screen, click it. Create a User Account. Be reminded that an email of confirmation will be sent to your email containing your username and password. As you have this information, log-in to the website and complete the application. 2. Do not forget to have all the necessary documents with you. Valid IDs should be scanned and can either be in JPEG or PDF format. IDs can be the following: passport, PRC ID, SSS ID, GSIS ID or Unified Multipurpose ID. 3. Now, it is time to pay for your test. There is a variety of options on how you can pay for the exam. ii. Other offline payment options? Follow this step. 4. The instructions will be given. Each will have its own validation process so be sure to comply with the instructions in the letter. Take note of the reference number for Bayad Center and Over-the-Counter payments. Here is the list below. These are easy steps on registering for the IDP. If you have further questions, you can ask your IELTS review center personnel for more information.